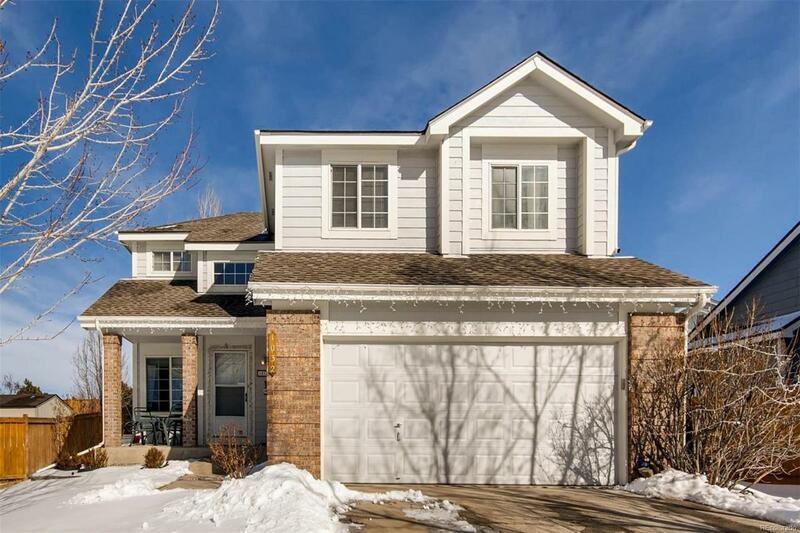 RARE FIVE BEDROOM HOME ON A CUL DE SAC in Plum Creek! Upon entering you will immediately love the light and bright feel of this home. Open concept living room with gas fireplace, dining room, kitchen, and powder room complete main level. Upstairs, find a master suite with full bath and walk-in closet, as well as THREE ADDITIONAL bedrooms and another full bath. In the basement, find a finished family room and ADDITIONAL bedroom, along with lots of storage. The huge private back yard with 6 ft. fencing has been meticulously landscaped, which you can enjoy from the large deck. New laminate wood flooring in living room and upstairs, new tile in dining room and kitchen, new carpet on stairs. Newer appliances in the kitchen. New interior paint. New master shower, tile flooring in both upstairs bathrooms. Roof app. 5 years old. SUPER CONVENIENT to I25, downtown Castle Rock, Safeway, DC Fairgrounds, DC Schools, the "Castle Rock" and so much more!